RSS Mohan Bhagwat: Government Should Make Law And Construct Ram Mandir ASAP: Speaking on the construction of the Ram temple in Ayodhya, RSS chief Mohan Bhagwat advocated the formation of a temple as soon as possible by bringing the proper law and condemning some conservative elements to obstruct the process. In his address during the annual Dussara festival in Nagpur, Bhagwat said that the conservative elements and forces are doing communal politics due to their own benefit. In this speech, he spoke on many important issues. Bhagwat said, 'India can once again become world guru but it will happen when he will go ahead with the Panchamrita mantra. A terrible storm came as Babur and he did not spare Hindus and Muslims of our country. He spoke on Sabarimala Temple case has not been respected tradition which is running for years. Bhagwat also gave a statement on the Ram Mandir. He said, "There is no issue of Hindu-Muslim. It is a symbol of India and by which the temple is possible, the temple should be built. Ram Mandir should be built ASAP. The government should build a temple by making laws. ' The RSS chief said that Ram is not only of Hindus but of the whole country. Bhagwat said that despite this kind of trick, the decision should be made in the context of ownership of the land as soon as possible and the government should make a road plan for the construction of the 'grand Ram temple'. 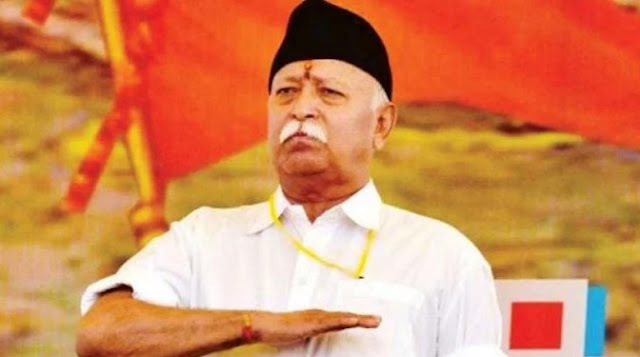 He said that RSS has always been associated with the feelings of millions of people in the country in the effort to build a temple at Lord Rama's birthplace. He said that Lord Ram is the symbol of the life of the nation and the importance of preserving religion. Bhagwat made it clear that we are not behind any one party, our motive is to run the country in the right way. On the issue of voting, Bhagwat said that it is all right but using of the nota is not wise.